In the game Road To Infamy, you are a gang leader competing to run the most infamous crime operation in Chicago. During each hand you are competing against the rival gangs (other players) to recruit the most powerful gangsters, buy illegal contraband, and bribe the cop. Road To Infamy is a unique card game that uses a board to help position the cards in the right spot. The game mechanics are fairly easy to learn how to play. After your first time through, you'll see the potential, strategy and playful skill it takes to become the gangsta king. 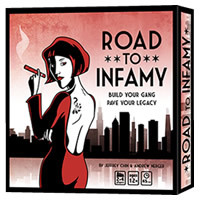 Give Road To Infamy a try and get your copy today. The player with the most Infamy Points will win the game. You'll get 4 gang mats, 52 contraband tokens, 57 bids, 4 brawl cards, 12 gangster cards, game board, cop marker, contraband bag and the official Road To Infamy game rules and instructions. Please keep in mind that the official Road To Infamy board game rules and instructions could be different depending on the game version you have. The rules below are some of the exact directions on how to play Road To Infamy. Share with us your comments, funny stories, tips, advice, strategies, creative ways to play, questions about how to play, problems with the rules or anything you want about Road To Infamy. All submissions will be reviewed within 24 hours. Click here to add your Road To Infamy comments.